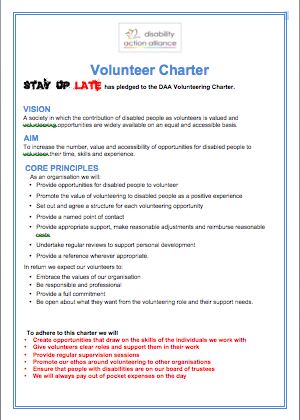 The vision of The Disability Action Alliance‘s volunteer charter is to create a society in which the contribution of disabled people as volunteers is valued. Also that volunteering opportunities are widely available and are accessible. To increase the number of volunteering opportunities for people with disabilities. To make sure volunteering opportunities are valued. That organisations make volunteering opportunities accessible. To recognise the valuable contributions that disabled people have to offer through their time, skills and experience. Provide opportunities for disabled people to volunteer. Promote the value of volunteering to disabled people as a positive experience. Make sure each volunteering opportunity is explained clearly. Provide a named point of contact. Provide appropriate support and to make reasonable adjustments. Undertake regular reviews to support personal development. Provide a reference wherever appropriate to help people in to paid employment and in to other opportunities. Embrace the values of the organisation. Provide a full commitment in their role. Be open about what they want from the volunteering role and their support needs. The Disability Action Alliance is a network of organisations all committed to making a difference to the lives of disabled people. They do this through creating partnerships between disabled people’s organisations with organisations from the public, private and civil society sectors. At Stay Up Late we’re committed to providing volunteering opportunities for people with disabilities. We’re therefore happy to sign up to Disability Action Alliance’s Volunteer Charter to make our commitment public. We also know we can always do better, and that things are always changing, so we continue to talk about how we can make things even better with our volunteers.